Abby Update - A Vision of Healing! : Abby at Home! Were able to go home to Fort Collins for an overnighter! We left Saturday morning and spend the day at home as a family. It was glorious. 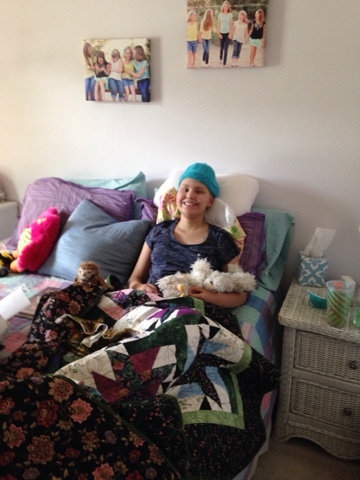 Abby loved being back in her room. The first thing she did is play with her owls with Anna. It was really sweet to see. We got up Sunday morning and she was feeling well enough to go to church. Even though she has that big blue mask on I could tell she was beaming underneath it because her eyes smiled the whole time. She was able to see friends she hadn't seen in two months and give lots of hugs. She even opted to stay through the sermon which surprised us all… No offense to our pastors. She had a friend over after church and Mark took them fishing. She wasn't able to touch any of the fish but she had a great time and she and her friend each caught one fish each. We have these amazing neighbors who have a fishing show and they always tell us the best place to go. I'm down in Denver with Abby and her tummy issues have ramped up again. At this point the C diff is gone so they think it might be some GVHD. That just basically means that Anna cells and her cells aren't playing nice together and it's affecting Abby's G.I. tract. They say it's good to have some GVHD because it helps fight any returning leukemia cells. If she continues to have issues we will have an endoscopy done and they will sample some tissue and test it to see and then we can go from there on treatment options. She also seems to be fighting a bit of a cold so we could use prayers for protection and healing there. She's not sleeping that great which is another prayer request. Other than those challenges, she's got her usual fighting spirit and continues to amaze us. We may be able to go home again this weekend on an overnight pass. That's all the latest news and we so appreciate your prayers. So glad you could go home!! !